As promised, Monolith Soft has delivered a large piece of single-player DLC for last year’s excellent Xenoblade Chronicles 2. That comes in the form of Torna: The Golden Country, a prequel story that takes place some 500 years before the events of the main game and delves into more detail on things only mentioned in the base game. The expansion can be purchased either as a standalone piece of content or as part of the season pass for the base game. This is important because Torna is split between needing to satisfy both its returning players and anyone just jumping in. Torna splits this difference fairly well at times, giving fans of the game a chance to see and play as returning favorites like Jin and Mythra (whose character design is still unsettling at best and downright offensive at worst), while also introducing us to important characters from the lore of Xenoblade Chronicles 2 like Prince Addam and Lora. At the same time, the expansion attempts to ease new players into its notoriously complex and robust mechanics. Unfortunately, in telling a more concise story, Torna also loses much of what made the original game so charming and fun. First, for anyone looking to pick this DLC up as a starting point, it does a surprisingly good job of introducing you to many of Xenoblade’s concepts and mechanics. 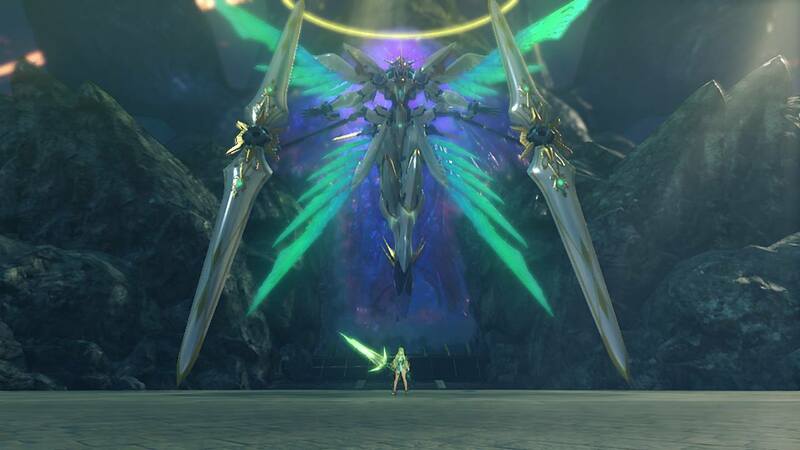 Monolith Soft has stripped away many of the extraneous features and systems in an effort to pare down the experience to something resembling a more reasonable playtime (you’re looking at something closer to 30 hours if you don’t choose to do everything). It is in that transition that the game falls flat. Where Xenoblade Chronicles 2’s base game could easily be criticized for being needlessly long and chockablock with a seemingly endless array of systems and things to do, the game was so long that it was able to luxuriate in its length and ended up having a rewarding depth in almost all of its many systems. Torna, on the other hand, removes enough of those fringe systems and delivers a more streamlined and linear experience that makes the side-activities seem much less interesting and certainly less rewarding. Additionally, if you are jumping in here, I imagine it could be difficult to understand exactly how these characters are important or what is happening most of the time. It is a prequel, sure, but much of the importance of these characters comes from the setup they receive over the course of the main game. The character of Addam, for instance, was interesting because he was revered and talked about at length in the base game but never shown. Much of his importance would be lost on new players, yet it is well done for those making the return trip. They also throw in a lot of hamfisted lore explanations up front for anyone who might not have spent 200 hours in this world already. That being said, the game does tell a complete story on its own with new characters that often rival their counterparts from the base game, so it isn’t without merit. It was, though, difficult enough for me to remember all the ins and outs of this convoluted narrative as it is, so you may be left floundering as a new player. This time out you follow Lora and her Blades Jin and Haze as they try and stop the rogue Blade, Malos. Many of the names will sound familiar to returning players, but it was nice to get a chance to see an oft-mentioned tale and to finally get to meet Lora, who in many respects is a much more interesting character than the ever-cheerful Rex was in the original. Plus not having a talkative Nopon in your party this time was a huge boon for me personally (sorry Tora fans!). Returning players will also notice countless changes—both large and small—to the formula. The largest and most successful of these changes comes in the updated battle system. Combat was already a highlight in the original game, but because those battles often took 30 or 40 minutes, and all that time was needed to really get the most out of combat, they opted to speed things up this time. It works incredibly well for the purposes of the DLC; you no longer will be recruiting endless Blades and equipping them to your characters. Instead, each of your three Drivers has two attached Blades and you are now able to directly control them. Before, you would control the Driver and the current equipped blade would supplement their power with abilities and different weapons. This time, the Driver and the two Blades all function the same in combat and can be swapped between at will. Constant swapping is incentivized by adding in a new recoverable health meter. As you take damage, you will see a red bar indicating recent damage that can be quickly earned back with a simple switch to another available character. It changes the flow of the combat by making you rely less on healing Arts (the game’s name for your abilities) or health potions and making it useful to take advantage of your whole team. It was a much more dynamic system; I only wish the combat was more challenging to take advantage of the changes. As it stands, the combat never required as much out of you as some late-game bosses from the main story. One of the most important aspects of high level fights originally was being able to take advantage of your characters’ elemental special moves to allow for devastating chain attacks. This was done by using a specific series of elements in order that would culminate in flashy, Blade Combo attack animations. This would in turn assign an elemental orb to the enemy; after enough of those encircled the foe, you could enter into a long string of attacks bursting those orbs and unleashing obscene amounts of damage. It was a complicated and lengthy process that was often necessary to defeat many of the more difficult encounters in the original game. While it may have been the most rewarding part of the combat there, again, this DLC doesn’t really have the time to let battles play out for that long. They smartly allowed for any elemental attack—regardless of whether it is finishing a powerful Blade Combo or not—attach an elemental orb, which, in turn means you’ll be pulling off chain attacks much more frequently. It is a fun change that feels at home with the increased pace of the experience, and allows you to see some of the best parts of the original combat experience without needing to spend nearly as much time doing it. There are plenty of other quality of life changes and tweaks that are too minor to get into here, but the other notable change that didn’t work quite as well comes in the form of the community level. Originally, each different area had a specific level that was increased by interacting with people and patronizing local shops; this would then open up more quests and items to purchase. With most of the shops gone (the items you would have bought there are now learned and crafted at campsites) that system is replaced by the community level. It works similarly in that by talking to people and completing quests you earn the favor of people and build a stronger community, opening up more quests. This was a mostly fine alternative that seemed to have little bearing on the experience if you wanted to ignore the often boring and tedious side quests. This is, until right at the end of the expansion when the game won’t let you progress until you’ve improved your community level several times. This means doing dozens of side quests when I was more interested in taking down the final boss. Monolith Soft doesn’t even bother to justify this in a meaningful way. Despite the final boss specifically telling me where he’ll be and goading me to attack—I must first curry the favor of local citizens so their morale will be higher. It’s not that I didn’t want to do any of the side quests, it’s that as optional quests I expected them to be just that: optional. I did nearly every quest in the base game, but that was because I was able to do them at my own pace and continue the main quest when it was appropriate. Having my progress halted only serves to highlight the poor quality of the side quests relative to proper story quests, and unlocking higher community levels does nothing but unlock even more quests to do anyway. If it, perhaps, gave you access to some better weapon to take on the boss then there might be merit, but as it stands, doing these quests was an annoying diversion that existed for no other reason than to pad the length of the DLC. It’s not that I’m disappointed by Torna’s content entirely. I still had a great time diving back into the Cloud Sea and exploring Alrest. The returning continent of Gormott, while it doesn’t include all the areas you’ll go to in the base game, is still a satisfyingly large and rich area to explore. They’ve also included the new continent of Torna which feels just as robust and fun to explore as any of the areas they left out. It remains staggering to walk through an area and see the head of the absurdly large titan you’re walking on jutting into the sky. And this expansion comes with a good mix of environments to explore and secrets to discover. The art maintains the same, more anime-inspired style from before, yet for some reason in this DLC many of the characters had a strange effect where the color from their skin would extend beyond the hard black lines around their model. It sounds like a minor gripe, but it felt like the game was constantly drawing outside of the lines and it felt unpolished. Plus, like with the base game, Torna runs at a severely diminished resolution when playing in handheld mode. The frame rate was generally fine as a result, but it is certainly not the ideal way to experience the game—docked with a Pro Controller remains the best option here. I had a good time getting to fill in some of the gaps in the stories of these characters (even if some of the female character design still doesn’t do the game any favors). While much of the core experience offers that same hearty dose of RPG content, it also stumbles over enough design missteps to keep it from being nearly the high watermark of Xenoblade Chronicles 1 or 2. It is not a complete failure, but it would be too bad if this soured a new player on playing any more Xenoblade in the future. For returning players, take heed: this is not going to be the same level of quality from the base game, but it has enough fun new additions to at least get you through to the end. Torna: The Golden Country is an ambitious addition to an already enormous game, but by stripping away many of the features on the sides of the experience, you’re left with a game that never quite finds the highs present in the original game. The story was fun, if hammy at times, but worth seeing. I only wish they had taken better advantage of the excellent changes to combat here to deliver more on the faster-paced combat rather than the dull and laborious side quests. Shorter length and standalone nature takes away some of the charm.